I have owned the KRK RP5G2’s for many years now, and they have done their job. When I first bought them, I figured I can’t ask for much more for the money. But recently I found a used set of Equator D5’s online, and since it wasn’t a lot of money, I decided to go for it ad I had read good things about them. But what sort of scheduled maintenance takes 3+ months? Just to recap: Equator Audio was founded by Ted Keffalo, an engineer/designer with a long pedigree, whom I had the pleasure of meeting a few years ago at the AES here in LA. The aim of the D5 (and, later, the D8) was to make high-quality monitoring affordable by selling directly to the consumer online. Initially, the D5 received unanimously rave reviews, but then came reports of questionable build quality and durability, and as things stand, it seems the company is in trouble. The D5’s have a wider stereo image, and more bass extension. At first, they sounded muffled compared to the RP5’s, but after a while, it felt more like the RP5’s were overly bright. I’m still undecided, though. The RP5’s sound good, but the bottom end is hard to judge on them. It’s like you hear the speaker more than the source material, down low. The alleged questionable build quality of the D5’s soon became apparent; at higher volumes (not crazy loud, still nearfield level), bass-heavy material causes some kind of vibration in the enclosure. It’s not loud or particularly distracting, but it’s there. To be fair, these are used speakers, and who knows what the previous owner did with them? I took a chance, and I may not have gotten what I needed. But the D5’s have really exposed the RP5’s for what they are: decent entry-level speakers, nothing more than that. What’s more, even though the D5’s may not be solution I need them to be (because of the noise), they have made it clear that I can’t go back, so it looks like I’m gonna need to invest in better monitors soon. I’ll probably keep the D5’s, though. I appreciate what they offer, and I suspect that they will work well with a sub. With a highpass filter before their inputs, I reckon the LF noise problem will be taken care of. In conclusion, this comparison over the last three weeks has reminded me just how different speakers can be, and it really gives a whole new meaning to the phrase “Alternative Facts”. Which speaker tells the truth? I feel like they both give a different view of what’s going on, but I’m not sure that one is necessarily closer to the truth than the other. On my shortlist of upgrades are the Genelec M030, Dynaudio LYD5, Neumann KH120, Pioneer RM-05, and HEDD Type 05. Interesting times ahead! This entry was posted in Uncategorized on January 18, 2018 by Menno de Boer. As it turned out, I had some time last Saturday and decided to stop by NAMM again on my way to a gig. I was there for less than two hours, but that was enough time to check out a few more things. One of the things I really wanted to check out, was Brazilian manufacturer Stay Music Stands. I found out about these guys two years ago, loved their keyboard stand designs, and wanted to get one. At the time they didn’t have US distribution, but the rep told me I could buy one of their floor models if I came back on Sunday right before closing time. I couldn’t make it and was bummed. So this time I made my way over there and was happy to learn that they have secured US distribution and will be available on Amazon soon. I was less happy about the fact that prices have gone up as a result, but that was -of course- inevitable. 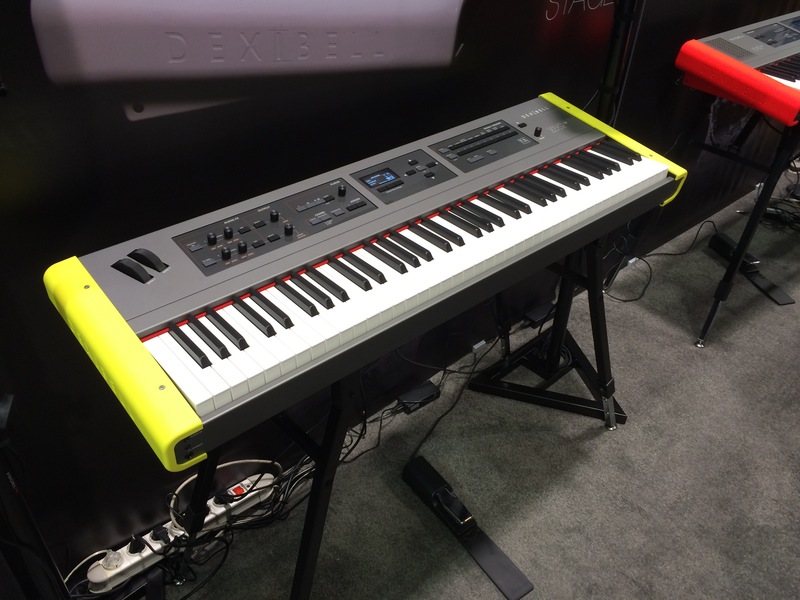 Behringer had a large number of their DeepMind 12 analog synth set up, and that is a fun little synth at a competitive price. Direct competitors are the DSI Mopho, which is the same price but has only 4-voice polyphony, and the Moog Sub Phatty, which is a little cheaper but monophonic. DeepMind offers 12-voice polyphony, an excellent-feeling 4-octave keyboard, and aftertouch. I hope someone swill do a head-to-head shootout with these three synths. DSI and Moog are the analog gold standard, and it will be interesting to see if Behringer can take the fight to them, sonically. 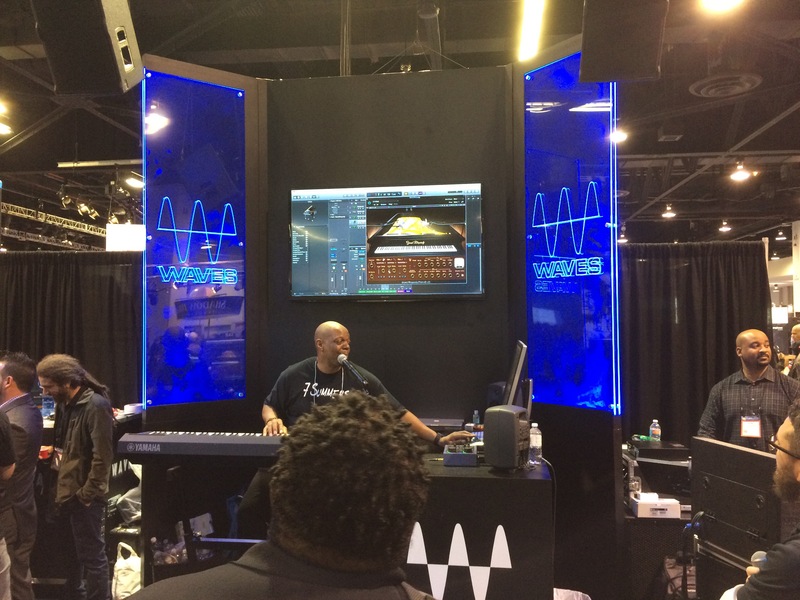 By chance I walked into a demo by Shaun Martin at the Waves booth, which turned out to be for a new virtual instrument, Grand Rhapsody. It is a sampled acoustic grand piano, and sounded pretty good in Shaun’s capable hands, although the demonstration was occasionally marred by audible CPU spikes. Rep says it will be available in February for an introductory price of $69. I also went upstairs to check out the Kawai booth. I’ve never had a bad experience with Kawai’s acoustic pianos, but I can’t say I have loved their digitals as much. This time I went to try out the MP-7, and I was not disappointed. I love the way it feels and the acoustic piano sounds are competitive, but while the rest of the sounds are good enough, I’m not sure the instrument’s over-all sonic footprint would compel me to deal with the considerable weight and bulk. I also tried out the new ES-110, which is decent enough for the price, but it doesn’t really stand out. Still, it is a viable alternative to Yamaha’s and Casio’s offerings in that price range, and probably the one I would pick if I was shopping for something like that. 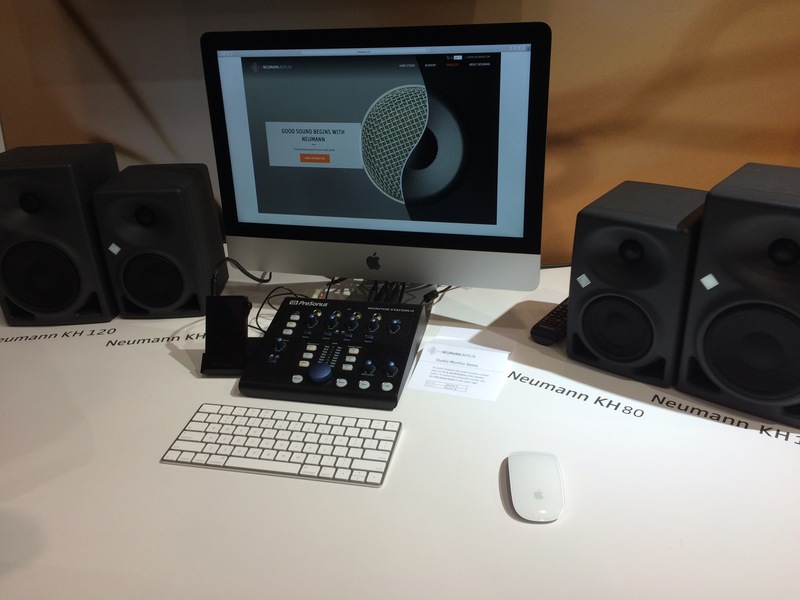 On the way out, I was surprised to see Neumann with a new active studio monitor, the KH-80. Surprised, as I tend to follow industry news, and this one somehow totally passed me by. It is a 4″ woofer version of their popular KH120. That was all I had time for, although I do want to mention I nearly bumped into Stevie Wonder. I would have actually bumped into him, but for his security detail. Touch Innovations had two excellent multi-touch displays in their booth, one ‘regular’ and a very ‘Tony Stark’-y see-through model. They offer bespoke software that tightly integrates it with MacOS, but comes as a subscription only. The day I can ditch point-and-click for a true multitouch desktop experience can’t come soon enough, but it is really just waiting for the DAW developers to recode their applications for this new input method. Until then, products like these are a nice interim solution. 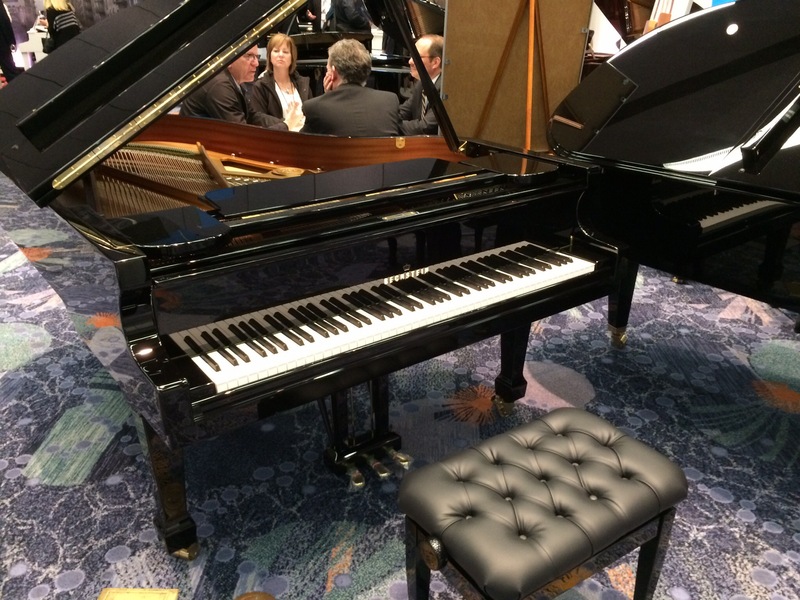 Austrian company Alpha Piano was there with two products. Their haute-couture (Porsche-designed) Alpha Piano, which is powered by VSL’s Imperial Bösendorfer sample library. It features an actual hammer-action, and comes at a price far north of $30,000 for the studio model. Expect to pay about ten grand less for the “portable” touring model. They also had their M-Piano on display, but something was wrong with the computer, and a demonstration wasn’t possible at the time. It looks like a really great idea, like the Roli, but better. And again, astronomically priced (~$12,000). I did see a couple of other interesting things on the way out, like Thonet & Vander, a German speaker company making Bluetooth products that do not look like props from a Star Trek set. All in all, this NAMM wasn’t as packed with new and exciting stuff as some of the previous ones, but it remains a great way to try out things you don’t usually see in the store, learn about new products you would otherwise never hear of, and it serves as a barometer for where the industry in general is headed. As always, I’m glad I got to go! This entry was posted in Uncategorized on January 23, 2017 by Menno de Boer. The NAMM Show in Anaheim is a pretty big deal for manufacturers, dealers and artists alike. I believe only the Frankfurt Musik Messe can rival it in terms of size and scoops. But I doubt the Messe boasts as many A-list musicians. NAMM is where you can literally bump into Stevie Wonder or another legendary musician of your choosing. Oh, and I say day one, but I’m not even sure I’ll be able to go back tomorrow or over the weekend, as I’ll be pretty busy. 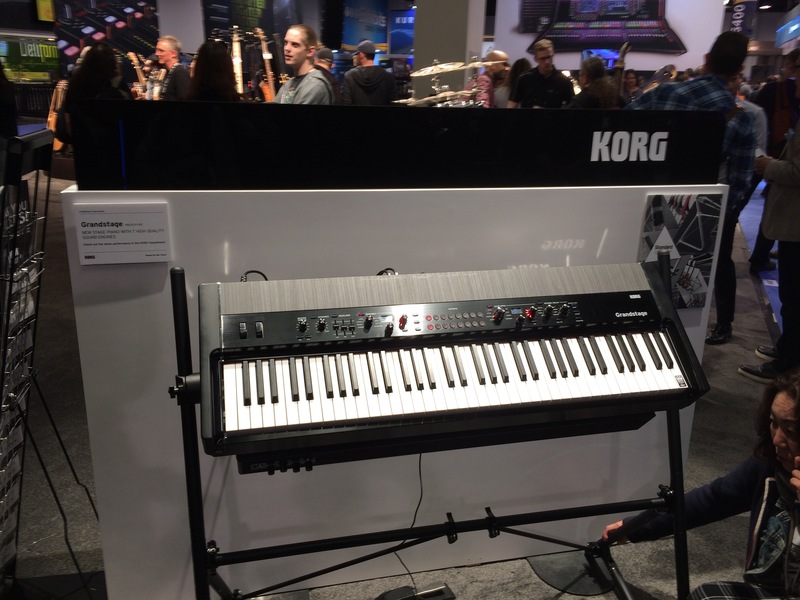 I’m covering NAMM from my own perspective, which is as a keyboardist and computer music producer. I won’t be talking about guitars, drums, or kazoos. With major new products already having been announced the day before, my first stop was the Roland booth, where I got my hands on the new RD-2000. It looks great and seems thoughtfully designed, but I’m not sure just how new it is under the hood. It sounds good, but it all felt very familiar. Not to say that’s bad, though. What is new is deeper computer integration, which is an area where Roland had some catching up to do. At $2499, this keyboard seems like excellent value. 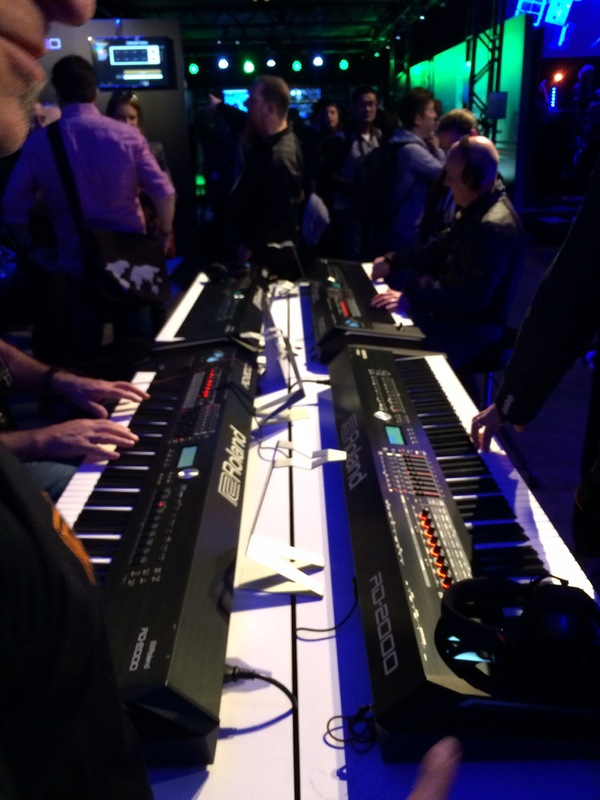 I finished my Roland visit with a demo by Omar Hakim, Scott Tibbs, Jerry Brooks and Mike Phillips. It was a great mini-concert, despite some technical difficulties. I veered off to the 88 lounge, where the acoustic piano manufacturers reside. My parents are both proud Bechstein owners and I was hit by a wave of nostalgia as the first thing I saw when I walked in was a pristine looking pair of their grands. But when I sat down and played one, I was disappointed. The sound, the action, this is not how I remember them. Next stop was Korg, where I hoped to get my hands on the mysterious GrandStage, but all they had was a non-playable prototype. But it is amazingly compact, with the right features, and if it has the acoustic and electric piano sounds from the Kronos or even Krome, at a price close to the SV-1, this would be a total no-brainer. I could see this replacing my aging Nord Piano. I took a look at the Odyssey with full-size keys, and was surprised at how big it was. People were crowding around it so I didn’t get to play it. I’m not much of an analog guy, but this is the synth that is all over ‘Headhunters’, and for that alone I want it. I really looked forward to getting my hands on Kurzweil’s Artis SE and Forte SE, as they are impossible to find in the LA area. I wanted to love it, but came away a little dissatisfied. At the same booth (AM&S), I got hands-on with the Studiologic SL88 controllers, both the Grand and the Studio version. They are identical except for the action, and I had my eye on the Studio as it is temptingly cheap at $499. Alas, I didn’t get on with the action, but the Grand felt really good. It costs more, but I’d say it’s worth it. Right next door was Nord, where I got to noodle on the Nord Piano 3. It feels different from my first-gen NP, the action is a little lighter but with more snap at the bottom. I like my NP, but somehow I don’t see a 3 in my future. Then I got to see some studio stuff, like the next-gen Aurora converters from Lynx Studio Technologies. The old ones have a stellar reputation, but the new ones are going to cost a lot more. An Aurora 8 USB retails for $1995, with the new one coming in at $2599. With Thunderbolt, it is $2195 and $2999 respectively. Ouch. Apparently they have been around for a while now, but I hadn’t heard of HEDD, a German speaker company headed by ADAM Audio founder Klaus Heinz. I spoke with his son, who told me they have two guys at the factory in Berlin who do nothing but fold ribbon tweeters all day. When I commented that must be boring work, he shrugged and said they used to be watchmakers. Love that story. I dug into a Silvertop at the Vintage Vibe booth, which really is as good as any Rhodes I have ever played (except maybe the short-lived and ill-fated Mk7). I would love to have one of these in my home studio, but I’d call this a luxury purchase. I wanted to try Dave Smith’s Rev.2 but it was impossible to get near one. DSI seems to be very popular these days. But I was really touched by the Moog booth. Rather than having all their products set up, it was a sort of memorial/tribute to all the synth pioneers and legends who passed away in 2016. It seemed out of place and appropriate in equal measure. Then I visited the Yamaha hall in the hotel next to the Convention Center, where Robert Glasper was having a little fun with the Montage. But in terms of products there was nothing new there, so I didn’t stay long. After a long line and a short lunch, I descended into the basement where I found a couple of interesting things. First I found the booth of Schertler, a Swiss company making combo amps with gorgeous wooden cabinets. They specialize in amplification for acoustic instruments. Unfortunately, I missed the demo, just for that I may have to go back today or tomorrow. They have no US distribution at this time, but they will ship from Switzerland, with shipping and import duties on their dime, AND a 30-day money back guarantee. I fell in love with the cabinets and can’t wait to hear them. Next I found Isovox, a Swedish company with an unusual product that almost completely encapsulates your head and microphone, giving you an actual vocal booth just about wherever you go. Interesting product, retails in Europe for 799 Euro. They await US distribution. Another clever idea is the BomeBox. A small MIDI hub that connects to DIN, USB, Ethernet and WiFi, and allows configuration via a web app. 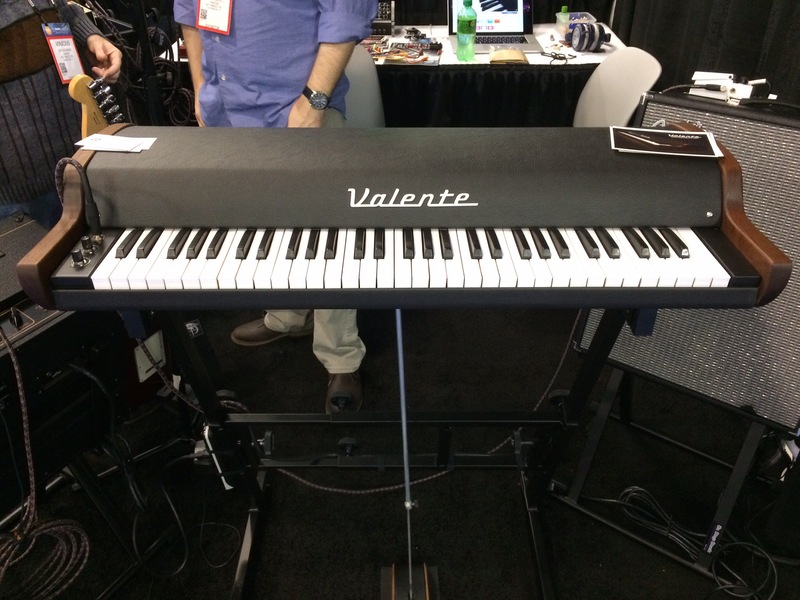 The Valente is a 61-key electro-mechanical keyboard (like the Rhodes and Wurlitzer) weighing just 50 pounds. It is made in Brazil and looks absolutely superb. My perennial quest for the right keyboard amp led me to stop by the booth of Elite Acoustics, which had an ultra-compact combo amp with nifty features. First, it runs off an internal rechargeable battery, it has a USB charging port, and plays back bluetooth audio. It’s not really powerful enough fot the type of band situations I deal with, but I can think of scenarios where this would come in really handy. Last stop in the basement was Shi Tuo, Taiwan-based manufacturers of studio furniture. Unfortunately, the rep spoke no English, but indicated someone who did would be there tomorrow. 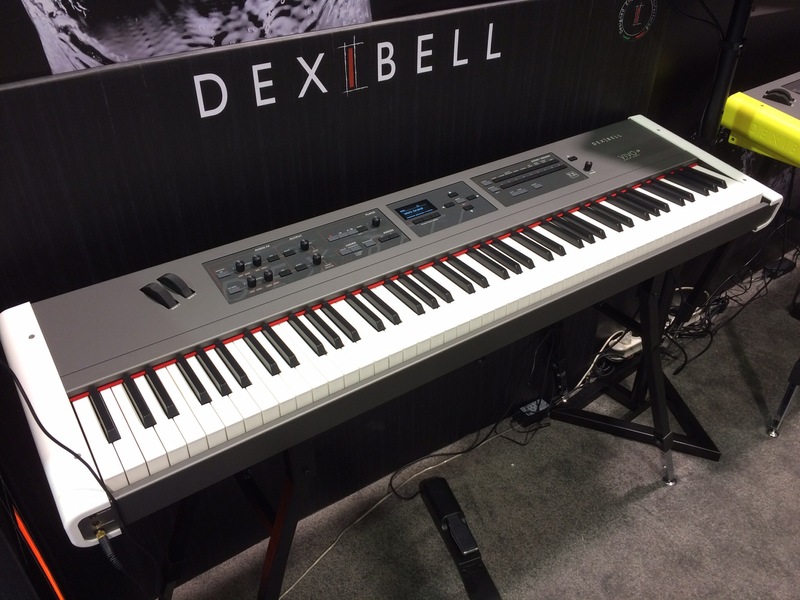 Back on the main floor, I was surprised to learn about this keyboard manufacturer I had never heard of, Dexibell. Their Vivo S7 and S3 stage pianos felt like mature products. Hard to tell just how good they were from a brief encounter on a noisy exhibition floor, but I would like to try them out in a more appropriate setting. I once again marveled at the sheer number of Chinese manufacturers with clone products, and next thing you know it was 6PM. There’s a bunch of other stuff I still want to check out, so I may have to come back tomorrow. If I do, I’ll post a follow-up report. This entry was posted in Uncategorized on January 20, 2017 by Menno de Boer. I’ve been playing with Adelaide’s band at Disney since May this year, and we’re gonna crank it up for the Holiday Season! Disney annual Christmas celebration called Viva Navidad starts on November 10, and we’ll be at the California Adventure Park every Saturday, Sunday and Monday, until January 8. This entry was posted in Uncategorized on October 25, 2016 by Menno de Boer.